There's a magical quality about the boreal forest in winter, and one of the best ways to experience it is on snowshoes. 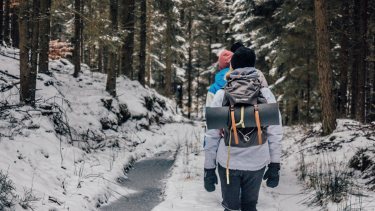 One of the most silent sports, snowshoeing lets you get immersed in the winter forest where you can hear, see, and smell things that you'd otherwise miss out on. One of the best aspects of snowshoeing is that you don't need a groomed trail. In fact, it's proper snowshoe etiquette to avoid snowshoeing on trails groomed for skiing, snowmobiling, etc. Some of the best snowshoeing is off the trail where you can experience the quiet and solitude of the winter forest. The state and national forests near Cascade Lodge are crisscrossed with unmaintained, unused roads which offer excellent snowshoeing opportunities.